Growing up, we never had soda in the house unless someone was sick and then my mother would only buy ginger ale. Her mother gave it to her when she was sick and she passed it on to us. For years I thought that it was just a special treat only for the sick. Over the years I’ve learned that it wasn’t just a treat it was actually to help us feel better. From what my family can remember, my grandmother had a number of uses for ginger in her frugal living journal and even grew it herself. When you buy ginger you should look for pieces that have the least amount of branching. 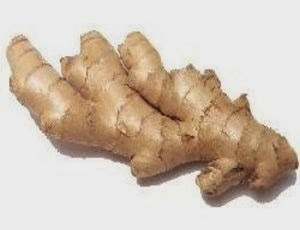 Ginger should be stored in a cool, dry place. Fresh ginger only keeps for 2-3 weeks in the refrigerator. To store ginger for a longer period of time, you should peel it and cover it with vodka. *the infused vodka makes a great martini. You can freeze ginger for 3 months. If the skin is wrinkled, the ginger will be hotter and more fibrous. You can easily peel ginger by tilting a spoon to its side and scraping down the root. Always consult a doctor before using ginger as a treatment. tablespoon of mustard powder to warm water. and 1 tablespoon of mustard powder to warm water. ginger and 1 tablespoon of mustard powder to warm water. drink a glass of ginger tea (recipe below). a glass of ginger tea (recipe below). glass of ginger tea (recipe below). and disinfect, dab the area with a thin slice of fresh ginger before bandaging. Diarrhea – to treat, drink a glass of ginger tea (recipe below). on a piece of fresh ginger. than add 10 dried rosebuds. Heat on low for 30 minutes. rub a sliver of ginger on the area, two times a day until it fades. container than add to your bathwater. dried rosebuds; heat on low for 30 minutes. make the tea, steep fresh ginger in hot water, allow to cool before using. teaspoons grated ginger, ¼ cup olive oil, ½ cup sugar and lemon zest. Skin Tone – to even out, drink a glass of ginger tea daily (recipe below). Boil the ginger in water for 10-20 minutes. Remove from heat and add honey and lemon. I never would have guessed that there were so many household tips for using ginger.